At the end of a full day of work putting the garden to bed — pulling out the spent tomato plants, bringing in the last of the peppers and eggplant, clearing, weeding, pruning, then clearing some more and mulching — this was a great meal to sit down to. Especially since the parsnips were part of what came in from the garden. Make-ahead tip: Marinate the chicken in the morning and stick it in the refrigerator; prep your veggies. At dinner time, all you have to do is put them all on a baking sheet and in about 40 minutes it’ll be ready. Oh, and don’t forget that green salad – what goes well with this is a mix of arugula (still going strong in the jardin) and shredded radicchio with a wine vinegar-olive oil dressing. The chicken dish will make four hearty appetites very happy. Adapted from our buddies at Fine Cooking. Stir together the oil, mustard, vinegar, salt, and 1/4 t of the pepper in a large bowl. Add the chicken and toss to coat. Cover with plastic wrap and marinate in the refrigerator, turning occasionally, for at least 1 hour and up to 8 hours. Heat the oven to 425̊F. Arrange the chicken skin side up on one end of a large rimmed baking sheet and drizzle with any remaining marinade. At the other end of the baking sheet, toss together the sweet potato, parsnips, shallots, and the remaining pepper. Spread into a single layer. Sprinkle the chicken and vegetables lightly with a little more salt and roast for 20 min. Baste the chicken with the pan juices using a brush and stir the vegetables. Continue to roast, basting and stirring every 10 min., until the chicken is burnished – deeply browned – and the vegetables are tender, about 30 min. more. Meanwhile, cook the bacon over medium heat in a large skillet until crisp, 5 to 8 min. Drain the bacon on paper towels. When the bacon is cool enough to handle, crumble it and toss with the parsley. When the chicken is done, stir the vegetables and transfer them to a serving bowl with a slotted spoon. Toss with half of the bacon mixture. Baste the chicken and transfer with tongs to a serving platter. Sprinkle with the remaining bacon mixture, and serve hot. 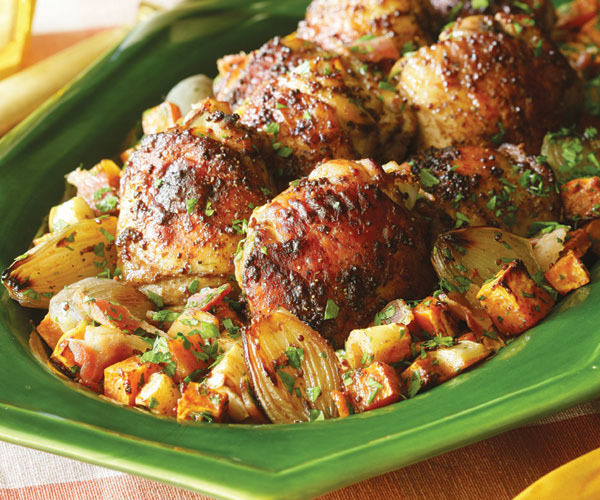 This entry was posted in Main Courses, Recipes, Recipes from Adrienne's pantry and tagged bacon, balsamic, chicken, mustard, parsnips, Shallots, sweet potatoes, thighs. Bookmark the permalink.